What It’s About: Psychologist Kris Kelvin (Donatas Banionis) journeys to a space station orbiting the mysterious planet Solaris. There he discovers one of the Cosmonauts dead and the others deeply disturbed by their encounters with the “Guests” the intelligent planet below sends to the station. Why Watch it Today? : Soviet filmmaker Andrei Tarkovsky died today in 1986. 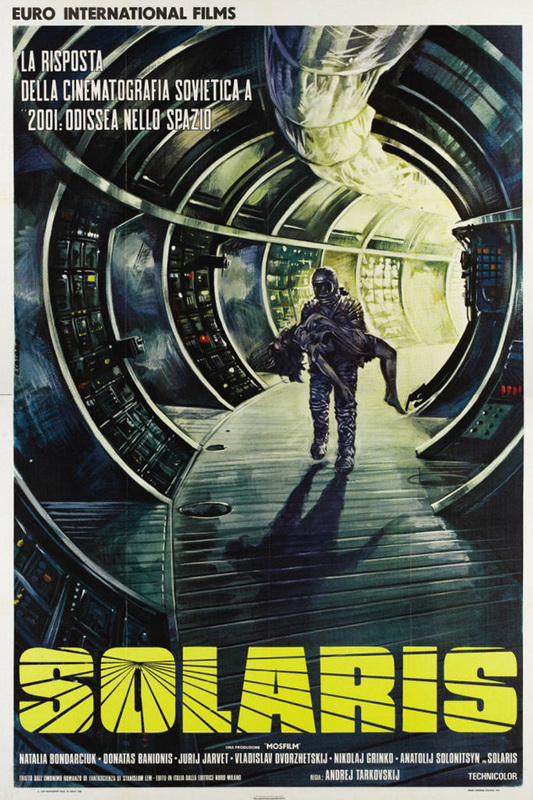 Tarkovsky’s Solaris is a unique, and influential take on science fiction, and appropriately is a meditation on life, loss, and the nature of reality and experience. This entry was posted in "Foreign Film", Adaptation, Aliens, Arthouse, Based on a Book, Drama, Movie of the Day, Mystery, Sci-Fi, Space Travel, Speculative Sci-Fi, The Original and tagged Andrei Tarkovsky, Cosmonauts, Mosfilm, Russia, Soviet Union, space exploration, space station, Stanislaw Lem. I had heard of it for years, so a few years back I took it out of my local library network, the Criterion edition. The Baroness and I watched it together and enjoyed it, though I think she mostly checked out after the very long “driving in Japan” sequence (which really shouldn’t be in the movie anyways-it was put there because the Soviet bureaucrats who approved sending the FX team over to Japan to learn techniques wanted proof that the trip was needed for shooting locations). I am just old enough for sci-fi to have had about three main forms when I was a kid: Star Wars style Space Opera, horror-sci-fi hybrids and the pre-Star Wars style that tended to be more thoughtful, and I enjoy all three.